What do children do on Saturdays ? A group of teachers who are members of the London Suzuki Group – a London based umbrella organisation of Suzuki teachers, which is in turn a member of the British Suzuki Institute. Jillian was brought up in New Zealand but studied the violin in Australia. After graduating she played professionally in the Queensland Theatre Orchestra playing both Opera and Ballet. While attending an Australian String Teachers’ conference she met the first American teacher to study with Suzuki in Japan, John Kendall. Mr Kendall, a graduate of the Juillard School in New York, offered her a scholarship to do a Masters in Performance and Teaching (Suzuki) in the USA. The programme included children who played Twinkle to Tchaikovsky and included teaching at summer workshops around America, national and international conferences. During this time Jillian was also fortunate to be coached in Chamber Music by the Beaux Art Trio which built on the coaching she had received from the Coull Quartet in Australia. After graduation Jillian taught at the Suzuki Program at Stony Brook University for a year before moving to London. Jillian established, and is the Director of, The Bayswater Suzuki Group which was based at the London Suzuki Group building in Bayswater. Before long, the Group outgrew the building and they started using College Park School, Bayswater which enabled Jillian to start an orchestra programme. The Bayswater Suzuki Group is now based in Holland Park at St Clements and St James Primary School. The Programme has grown such that it now includes three Orchestras, Chamber Music for advanced players, Choirs, Violin & Cello groups and a biannual Tour Group to different European countries. Jillian directs three summer courses: A Chamber Music Course, Sfzorando (Suzuki Course PT to Book 7) and the Extravaganza (Opera or Musical) in the Summer Holidays. Over the last 20 years Jillian has been invited to teach at Workshops in many European countries including, Ireland, Holland, France and Spain. In 2016 Jillian was delighted to accept the Directorship of Bryanston International Summer School which she has taught at since it began. See also Jillian’s teaching dates for this term. Helen Neilson teaches cello across an eclectic range of environments, working with students mostly aged 4-18 from a variety of different backgrounds. She is fascinated by the developmental processes at play through learning a string instrument and takes a holistic approach towards her work. Helen is a strong believer in the value of group work as a complement to individual lessons and is convinced by the power of environment upon development. She has a great respect for children and for their innate capabilities, and very much enjoys helping to facilitate the natural process of children learning from each other. She is interested in the human journey ahead of final outcomes, although interestingly she finds that looking after the former often leads to results of excellence in the latter. Helen’s home teaching practice, “Our Cello Community @ The Lodge, SW4” is well established, and she has enjoyed seeing her first generation through from age 4 to their later teenage years and out into the world. The next generation is now thriving and many of her students attend the Bayswater Suzuki Group. Her wider professional activities include being cello tutor and Head of Strings at Latymer Upper School, where she is enjoying developing the chamber music programme and likes running large workshops with visiting teachers for the string students to help motivate and inspire them. She teaches cello at St Paul’s Girls’ School and also on a whole class strings programme at the Sir John Cass Foundation Primary School in Tower Hamlets where every child is fully funded to learn a string instrument as part of their school curriculum. She is also a deputy teacher at Morley College Centre for Young Musicians and the Royal College of Music Junior Department, and is a consultant to the London Music Masters programme, helping to train some of their cello teachers. She was previously Director of Cello Club, the junior division of the London Cello Society and now enjoys teaching regularly on their Cello Days and workshop events. Courses taught on include Bryanston; CelloFest; Pro Corda Cello Course; Bayswater Chamber Music Course. Chamber music and orchestral playing have always been strong passions for her. Helen holds chamber music prizes for string quartet playing from the Royal College of Music and Trinity College of Music. She enjoys working on collaborations with her colleagues when the opportunity arises, and has given recitals at numerous venues in and around London and beyond. She plays regularly with many freelance orchestras, including St Paul’s Sinfonia of which she was a founder member. She played cello with them for ten years, including in their tenth anniversary concert at the Queen Elizabeth Hall in 2015, and has regularly played double bass with them since then, including principal. She mostly freelances as a double bass player now with a variety of orchestras. She loves travelling with orchestras and enjoys dates in London and around the English countryside as well as tours further afield including trips to India and China. She also loves playing with large cello groups. A highlight concert for her was playing with 167 cellists from around the world, directed by Mstislav Rostropovich, “Slava”, in front of the Brandenburg Gate in Berlin in 1999 at a street party for 100,000 people to mark the tenth anniversary of the Berlin Wall coming down. They played Bach Arioso and Davidoff Hymn, and also played as backing string for German pop band “The Scorpions” in “The Wind of Change”. It was very cold outdoors in November so all performers had mountaineers’ hand warmers inside their fingerless gloves! Her own cello studies included time learning with Anna Shuttleworth, Melissa Phelps and Naomi Butterworth. Her RCM studies were funded with generous support from the Countess of Munster Musical Trust. She has been very grateful for the opportunities for collaboration and observation of a wonderful range of teachers from the international circuits offered through her Suzuki work and training. She has learned a huge amount from too many to mention, but is particularly grateful for her opportunities to learn from Carey-Beth Hockett. Helen loves swimming in the sea, so any opportunity to combine this with music is always a hit. She has to be very strong to carry all her instruments around, so is frequently to be found in the hot yoga studio. She cycles whenever she can, but not when carrying a double bass! Whilst at school, Matthew was leader of the Stoneleigh Youth Orchestra for two years, taking them on tours to Italy, Germany and the Czech Republic. He went on to read Maths at Queens’ College, Cambridge. During his time there, he played for three years with CUMS 1, and performed Bloch’s Baal Shem Suite with the orchestra of the St. Margaret’s Society. He now plays regularly for both the Kensington Symphony Orchestra and Chelsea Opera Group at the Queen Elizabeth Hall, Cadogan Hall and St.John’s Smith Square. He also performs in concerts and at functions with the Gallery String Quartet that he set up in 2012. 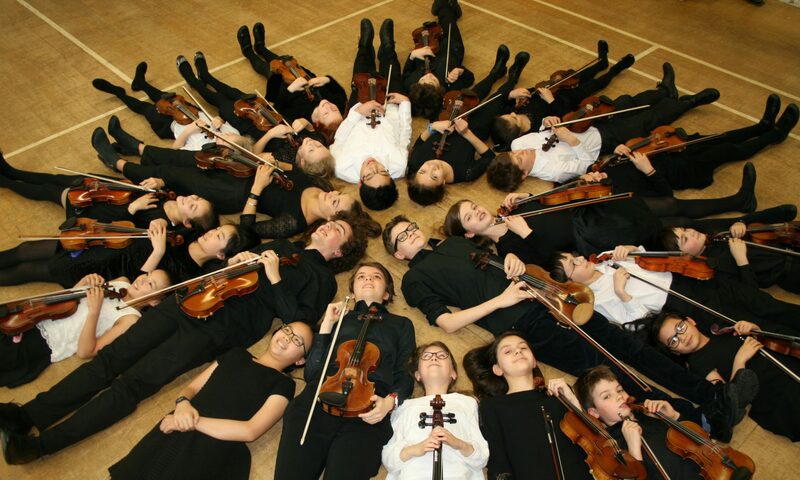 He currently teaches the violin full-time at Ashmole Primary School for London Music Masters – a musical charity that provides every child in the school with free violin tuition using a strongly Suzuki-based approach. British pianist Alice Pinto has given critically-acclaimed performances both in the UK and abroad, as a soloist, accompanist and chamber musician. Recent highlights include live broadcasts on Icelandic national radio, concerto performances with the Cambridge Graduate Symphony Orchestra, Cheltenham Symphony Orchestra, and St. Paul’s Sinfonia, and appearances at Við Djúpið Festival, Two Moors Festival, Cambridge Summer Music Festival, Lake District Summer Music, St. John’s Smith Square, Kings Place, and with Orpheus Sinfonia Principals. Alice is equally at home as a writer and presenter as she is a pianist. She is a regular guest at the Malcolm Arnold Festival in Northampton, having presented lecture recitals in 2012, 2014, 2015 and 2016. Increasingly renowned for her work with young musicians, Alice is a sought-after teacher. She gained her LRAM in 2011 and currently teaches piano and chamber music at Dulwich College and Bute House Preparatory School, having previously taught at Junior Guildhall, Dame Alice Owen’s School, and King’s College London. From 2013-14 she held a Leverhulme Fellowship with Pro Corda, and coaches regularly on courses alongside adjudicating for CMF. Alice works frequently as an accompanist and coach with talented teenage musicians, including students at The Purcell School and junior conservatoire departments, regularly accompanying auditions, concerts and competitions. Alice gained her MMus degree (performance and research) from the Royal Academy of Music, where she held a Richard Carne Scholarship and was short-listed for the Jacob Barnes Scholarship. As an undergraduate, Alice was a finalist in every internal competition she entered including the Beethoven, Chopin, Scarlatti and open recital prizes and was awarded the Anthony Lindsay Piano Prize and the Manager’s Discretion Prize in the Jaques Samuels Intercollegiate Piano Competition. She graduated with first-class honours and the Isabelle Bond Gold Medal keyboard nomination. Alice was previously the Else and Leonard Cross Memorial Scholar at the Royal College of Music Junior Department and the Nora Day Keyboard Scholar at St. Paul’s Girls’ School, where she was also the Alice Lupton Keyboard Prize winner. Alice has a Suzuki background and was a violin/viola student of Jillian Leddra. She still plays for fun and especially enjoys the string quartet repertoire. Helen was a Choral Scholar at St Catharine’s College, Cambridge, touring America, France, Ireland and the UK (and read Classics in her spare time). She also played with the college orchestra and depped for CUMS 1 and other ensembles. She continues to sing, play the violin and piano, and recently recorded a CD with the Godwine Choir, with whom she has toured England and Brussels. After Cambridge, she completed an MA in History of Art at the Courtauld Institute, before spending several years working for an interior design & build company. She is now a freelance illustrator: her designs include the LSG Bryanston branding and logo. On Saturdays, Helen takes chamber music, accompanies the younger classes, works with the orchestra and takes sectionals. She is also Art Director and administrator for Jillian’s summer course, the Summer Extravaganza.